A compact SUV with seating for up to seven, the Dodge Journey is a great blend of efficiency and utility with style to match. The Journey has long been popular among Phoenix-area shoppers looking for a modest family vehicle that offers lots of cargo and passenger space at a great value. Available with a V6 engine and an all-wheel drivetrain, the 2017 Dodge Journey in Scottsdale also shows off in the performance department. To learn more about the various features on this popular family SUV, continue reading our in-depth review below. 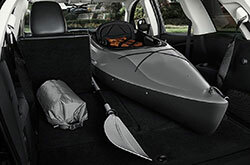 Whether you need seating for five or seven, the Dodge Journey has those bases covered with both two- and three-row configurations. 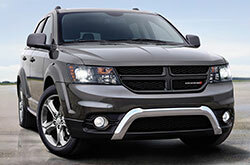 With five trim levels--base SE, SXT, Crossroad, Crossroad Plus and GT--and a variety of package options, 2017 Dodge Journey reviews are impressed by how many choices buyers have. Standard equipment includes keyless entry and ignition, a tilt-and-telescoping steering wheel, heated mirrors and a 4.3-inch touchscreen radio. Starting at Crossroad Plus, the 2017 Journey boasts shiny creature comforts like tri-zone automatic climate control, a power driver's seat, leather upholstery with mesh inserts and an 8.4-inch touchscreen with Bluetooth audio and a built-in WiFi hotspot. 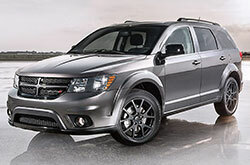 Many 2017 Dodge Journey reviews commend the SUV's standard 2.4-liter four-cylinder powertrain for its good balance of power and fuel efficiency. 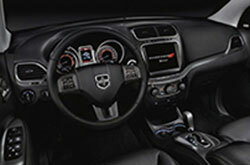 Rated at 173 horsepower, four-cylinder models can get up to an EPA-estimated 26 highway mpg. For even better performance, the top-tier GT trim boasts a standard 3.6-liter V6 engine with dual-variable valve timing that makes 283 horsepower, and offers a comparable EPA-estimated 25 highway mpg on select models. When properly equipped, V6 models can also tow up to 2,500 lbs. Designed with active head restraints, electronic stability and traction control, antilock brakes with brake assist, and electronic roll mitigation, the 2017 Dodge Journey in the Phoenix metro area offers drivers the confidence they need to take on the open road. 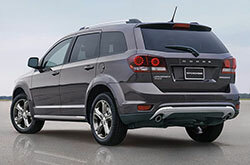 The family SUV can also be had with a rearview camera and rear parking sensors to improve visibility when backing out.